Scooper - Technology News: Global natural wealth is shifting. Here's why. Global natural wealth is shifting. Here's why. Contrary to popular belief, developing countries appear relatively poor in resource wealth compared to developed countries. At least, that is what the data show. According to the World Bank, proven reserves of hydrocarbon and mineral deposits per square kilometre in the African continent ($25,000 per km2) are much lower than in the OECD ($130,000 per km2) (Collier 2011, McKinsey Global Institute 2013). Of course, that apparent disparity in the relative natural wealth of nations might just be an artefact of the data and simply reflect the fact that the developing world has largely been much less subject to exploration. Interestingly, major discoveries in the developing world have relentlessly increased for decades narrowing the gap in (known) resource wealth between developed and developing countries. 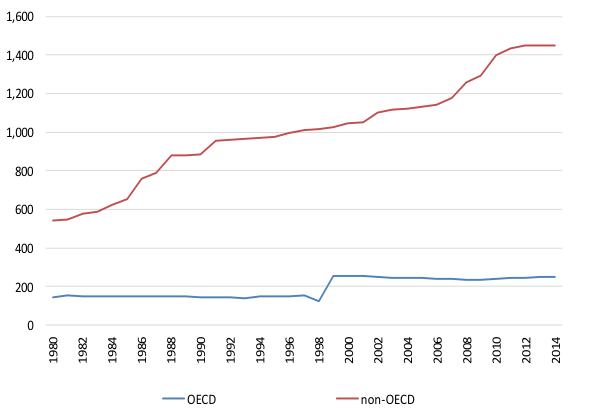 According to existing data from geologists, OECD countries accounted for 37% to 50% of all natural resource discoveries between 1950 and 1989, but they accounted for only 26% in the past decade, with sub-Saharan Africa and Latin America doubling their shares, to 17% and 27%, respectively. Latin America has had the most mineral and oil discoveries in the past two decades. For crude oil, Figure 1 shows that proven reserves have grown continuously over the past decades and have shifted from high-income countries to the emerging market and developing economies. These major shifts in resource discoveries from North to South are associated with efforts in emerging market and developing economies to open up to foreign investment and/or improve their institutions – including more stable government and a stronger rule of law. This has enabled the supply of natural resources – from oil, gas, and coal to all kinds of minerals – to rise, so that concerns that the world will soon run out of oil, gas, and minerals may be misplaced. Several authors have emphasised the role of institutions in the exploitation of natural resources (Bohn and Deacon 2000). Less work has been done, however, on the relation between the role of institutions and exploration of natural resources. Cust and Harding (2016) explore the role of institutions in determining the likelihood of discoveries by exploiting cross-sectional variation from strips of land of 500 metres that overlap a border and stretch out in two different countries for which arguably the geology is the same either side of the border. They find significant differences in the frequency of discoveries across borders and conclude that institutional quality is an important driver of oil discoveries. The evolution of political institutions such as the rule of law over the last decades also shows a North-South convergence as various emerging market and developing economies adopt standards already prevalent in the North. And the rapid improvement in the institutional environment in many developing economies in the 1990s coincided with the increase in the share of oil and mineral discoveries in Latin America and Africa. 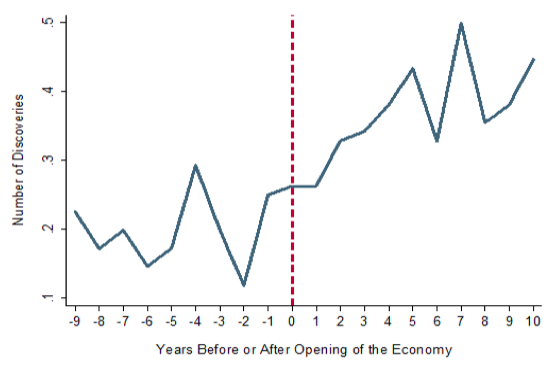 The increase in discoveries after countries open up is stark (Figure 2). In Peru, for example, discoveries more than quadrupled, in Chile they tripled and in Mexico they doubled. These discoveries not only occurred when commodity prices were high, but also when commodity prices were at historical lows. To provide a conceptual framework for these global shift in resource wealth, in new research we extend the depletion and discoveries model of Pindyck (1978) to an international context where globally operating resource companies shift exploration activities until no arbitrage opportunities are left (Arezki et al. 2016). This leads to three theoretical predictions: (1) as countries open up, discoveries shift from North to South; (2) resource discoveries increase as demand for resources rises; and (3) depleting reserves first leads to more discoveries (the probing effect) and then eventually to lower discoveries (the running-out effect). To test these predictions, we estimate a three-way panel of major oil and gas discoveries (obtained from Mike Horn, a former president of the American Petroleum Geologist Association) and mineral discoveries (obtained from Minex, a consultancy) between 1950 and 2012 in 128 countries for 33 different natural resources – including oil, metal ores and minerals. The estimates control for country, year and resource fixed effects, so take account of, say, global common shocks, technological progress, geological information for particular resources on individual countries, and big countries perhaps having more discoveries. A generic measure of market orientation for institutional quality is used, since this is seen to be more credible. We find that a country’s market orientation is associated with a statistically and economically significant increase in the likelihood of resource discovery. Countries discover more natural resources after they adopt market-based institutions, especially when they improve the investment climate and government stability – for example, when contracts are strengthened or expropriation risk is reduced. A country’s proven resource endowment is thus in part determined by its institutions. Improvements in institutions and policies related to the opening up to foreign investors have an economically large impact on the likelihood of major resource discoveries. Estimates suggest that if all of Latin America and sub-Saharan Africa were to adopt the same quality of institutions as the US (as measured by the International Country Risk Guide), the number of discoveries worldwide would increase by 25%, all else equal. Demand and reserves matter too as predicted. The results also hold if exploration spending instead of discoveries is used as the dependent variable or if different measures of institutional quality are used. The results also suggest that the effects of opening up hold for mineral and hydro-carbon discoveries separately. From a policy standpoint, the North-South shift in the frontier of resource exploitation is likely to have important, mainly beneficial consequences for individual economies with newly found natural resources. Indeed, these discoveries expand the list of resource-rich countries. They also portend positive economic developments. New mines mean more investment and jobs, especially in the resource sector, and increased government revenues, that if properly spent can increase the health and welfare of the people. The new production has fostered new trade routes from Latin America and Africa to emerging Asia – such as China–Ghana and China–Chile – multiplying commodity trade alone on those routes by more than 20 times since the 1990s. However, it is important that the income from the new resource discoveries is not squandered but spent on high-quality growth enhancing investment to ensure that the whole country benefits. Improving on the knowledge of what lies beneath their soil is important but it is equally important for authorities to negotiations with multinational corporations to find the just middle ground between incentivising exploration and making sure that resource income can be used to further development. Of course, exploration and development has not increased only in those countries with newly improved institutions. The re-emergence of US oil production through the use of fracking technology suggests that technology, depending on how and where it is adopted, could to some degree attenuate the North-South shift in the frontier of resource extraction. That said, as the South continues to develop an environment that encourages investment, the move of resource exploration and extraction to emerging market and developing economies will continue. Arezki, R, F van der Ploeg and F Toscani (2016), “Shifting Frontiers in Global Resource Extraction: The Role of Institutions”, CEPR Discussion Paper No. 11553. Bohn, H and R T Deacon (2000), “Ownership risk, investment, and the use of natural resources”, American Economic Review 90 (3), 526–49. Collier, P (2011), The Plundered Planet: Why we Must — and How we Can — Manage Nature for Global Prosperity, Oxford University Press. Cust, J and T Harding (2014), “Institutions and the Location of Oil Exploration”, revised OxCarre Research Paper 127, Department of Economics, Oxford Center for the Analysis of Resource Rich Economies, University of Oxford. McKinsey Global Institute (2013), Reverse the Curse: Maximizing the Potential of Resource-Driven Economies. Pindyck, R S (1978), “The Optimal Exploration and Production of Non-renewable Resources,” Journal of Political Economy 86, 841-861.